Sony and Capcom have released almost 30 minutes of new gameplay for Marvel vs. Capcom: Infinite that showcases various elements of the brawler ahead of its scheduled launch later this year. The footage, which you can see for yourselves above, provides a whistlestop tour of Infinite‘s suite of content, beginning with a short sampling of the beat ’em up’s story mode. For those that have already downloaded and dissected the PlayStation 4 demo released during E3, today’s PlayStation Underground video retreads much of the same ground, although additional commentary from Capcom’s Peter Rosas provides some extra morsels of information. 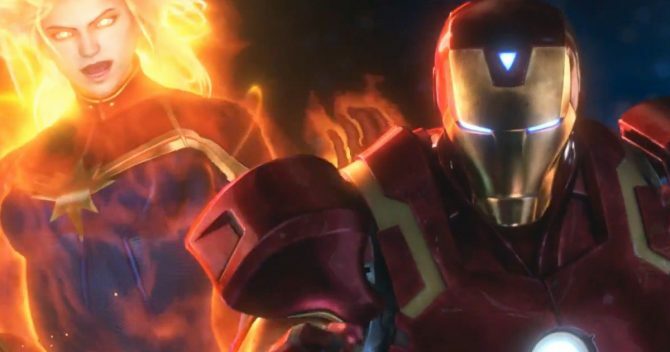 We’re also treated to an extended look at several characters from both sides of Infinite‘s roster, including Marvel’s Ultron, Thanos and Captain Marvel, as well as Capcom’s Ryu, Strider and Dante. As we’ve come to expect by now, every confrontation – whether it be physical fisticuffs or comically huge laser beams – is bathed in more color than you’d find in a rainbow, but while the on-screen action can sometimes be hard to follow, players should have no trouble making combatants perform impressive combos. Capcom’s going to great lengths in order to make Infinite accessible to as wide an audience as possible, a result it hopes to achieve with a simplified – and optional – control scheme similar to that seen in Marvel vs. Capcom 3. This iteration, however, appears to be much more intuitive, with the gameplay showing several characters performing multi-hit aerial and ground combos with the press of a single button. Whether the new direction will inadvertently alienate veteran genre fans from sinking time into the sequel remains to be seen, but Rosas assures viewers that both types of player can happily coexist. Marvel vs. Capcom: Infinite is out September 19 for Xbox One, PlayStation 4 and PC, with those that pre-order any of the title’s various editions gaining access to additional character Sigma. Capcom has yet to properly outline its post-launch DLC plans, but for those hoping to see a certain group of mutants show up, you might want to lower those expectations now.